I'm always on the look out for creative people who can take something that is not thought of as fun or not traditionally geared towards younger kids, and then make it fun and gear it toward younger kids! That takes talent and creativity, which I love. A subject like chemistry is definitely not something you think of introducing to a 2nd or 3rd grader, or would consider it fun -is it? Let me share with you something that will totally change your mind! While looking ahead to the coming weeks of memory work for CC, when we will be entering into the study of the periodic table of elements, I came across this book. While we won't be trying to learn it all, we will be trying to memorize the first dozen or so elements on that table and I wanted a fun way to do that. I am always trying to find things that are hands on and bring to life anything we are memorizing, and that's when I came across this terrific resource! This coloring book (which is a name that really does not do it justice) is geared towards younger children, is creative, full of information that is easily digested for younger audiences, and it is fun to do together! I LOVE it! 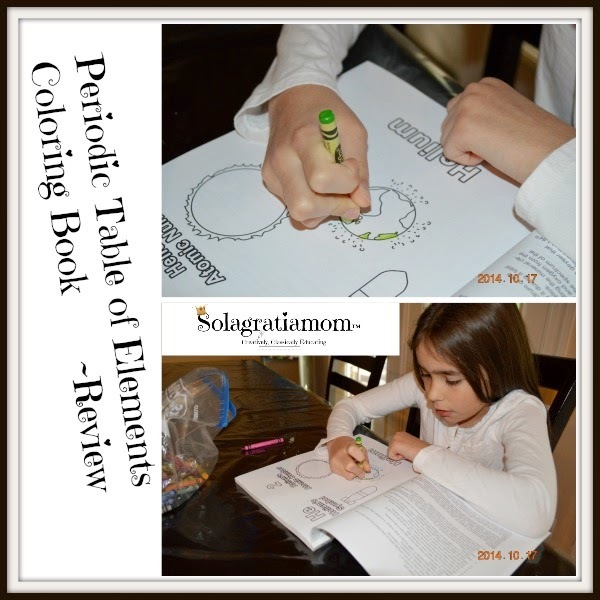 The Periodic Table of Elements Coloring Book by Teresa Bondora and illustrated by Ty Mullery, is a terrific book for kids. It combines the coloring of symbols and items made up from the element featured, with a concise amount of information relevant to that element and then a brief history summary of how that element was discovered. This is a clever approach to teaching the elements geared toward young children and I highly recommend it! This book enables a child to become comfortable and familiar with the concept of elements making up their world. She does a good job of laying a foundation for understanding that chemistry is not scary but rather, it makes up all sciences - earth, physics and straight up chemistry. She does not touch on the more complex elements and the man made elements, so as to keep things simple for the younger ages. Not only did my daughter enjoy reading it and coloring it, but my special needs son also liked it, with it's large letters and numbers featuring each element. We have thoroughly enjoyed this book. I'd say it's a must have for anyone introducing the elements this year! If you are interested in purchasing this superbly done coloring book (really it's so much more than that - the name coloring book just doesn't do it justice) - then you can get it by clicking below! Not convinced? 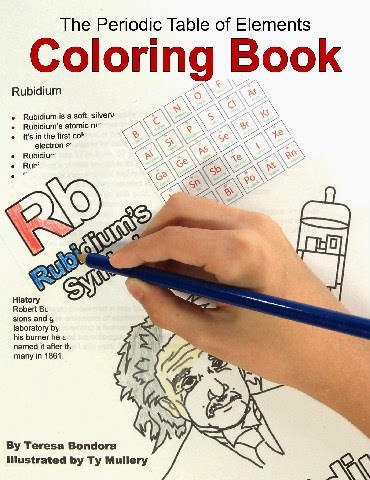 You also can get a free sample of this coloring book, to try out a page, by going to http://howtoteachscience.com. Teresa also has other valuable resources over at her website worth checking out! I hope if you get this book, you will comment below if you love it as much as I did!